You know that using shortcuts can save you time, but how can you remember them all? With over 30,000 keystrokes built in, KillerKeys applications know the keyboard shortcuts for practically any program you use - so you don’t have to. Stop digging through menus and simply use any of the KillerKeys programs to have the right shortcut always available – for practically any program you’re in. The KillerKeys software works with over 100 applications, and includes keyboard shortcuts for the most popular, from Microsoft Office to the Adobe Master Collection (Photoshop, Illustrator etc), QuickBooks and even Gmail and Twitter. KillerKeys senses the program that you are in, displaying the application’s keyboard shortcuts automatically. It’s simple and fun. KillerKeys is available in three different forms depending on your needs. 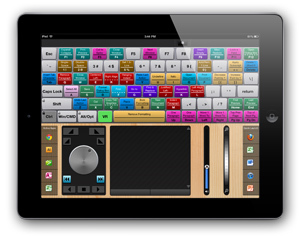 KillerKeys Pro is the top-end program with all the features, and connects to the free KillerKeys Pro iPad App. KillerKeys Express for iPad gives you complete wireless control over your computer with interactive shortcuts - all on your iPad! KillerKeys VR is the virtual shortcut keyboard you’ve been waiting for - right on your desktop! KillerKeys Pro puts you in charge of your shortcuts. Regardless of which application you are in, KillerKeys can show you the shortcuts you need without having to memorize them or dig through menus. View your shortcuts in a traditional keyboard view with the on-screen VR Keyboard, drag shortcuts to your desktop, or put your iPad to work with the free KillerKeys iPad App, giving you all your shortcuts and complete wireless remote control of your computer, right on your iPad. 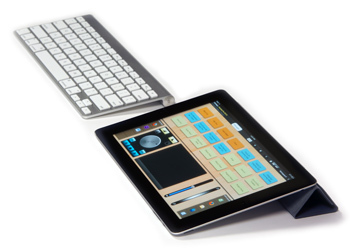 The free companion iPad App for KillerKeys Pro connects wirelessly to the desktop computer providing complete control from the iPad. Working in unison with KillerKeys Pro, the iPad App instantly displays the shortcuts for practically any application right on the iPad, providing shortcuts right at your fingertips. 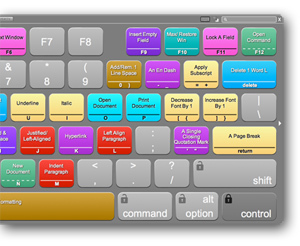 KillerKeys VR, available through the Mac App Store, provides a virtual on-screen keyboard that shows color-coded shortcuts displayed on each key of the virtual keyboard. The keyboard is interactive, so pressing either a single modifier or a combination of modifiers will change the shortcuts displayed on the keyboard. KillerKeys Express for iPad gives you complete wireless control over your computer, showing shortcuts for the application you are working in on your computer on a VR (Virtual) Keyboard on the iPad App. KillerKeys Express also includes a track pad with pinch-to-zoom control, application launcher, volume and zoom controls, as well as a multimedia widget with jog wheel.